Fingerprinting revolutionized the field of forensic science because it is a method of absolute identification connecting a person to an object. A person guilty of a crime could no longer deny his or her presence at a crime scene without weaving a web of lies. 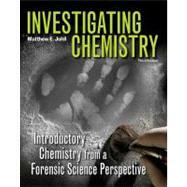 Understanding how fingerprint evidence is collected and preserved requires a knowledge of the chemicals present in a fingerprint. The chemical composition of a fingerprint can vary from one individual to another and may contain various inorganic ions, organic acids, lipids, and water. Book jacket.